– a willingness to employ strategies for survival. Miyamoto Musashi (1584-1645) for his Niten Ichi Ryu (two sword style), his success in over 60 duels and for his authorship of the Book of 5 Rings. Tsukahara Bokuden (1490-1571), as the progenitor of the Kashima Shintō-ryū, one of the most famous schools of swordsmanship in Japan. He also called his system Mutekatsu-ryū (“the art of No-Hands fighting”) to illustrate his concept of moving beyond relying on the blade alone to resolve a conflict. Read here for stories of his “no-hand” fighting style. Against an attack by Musashi, using his famous two-sword technique, Bokuden who was himself a master of the sword, reaches not for a sword, but utilises two wooden “pot lids” to defend himself. It is well known that Musashi, towards the end of his duelling life, favoured fighting with a wooden bokken rather than a live blade. Such was his skill, he was able to defeat (and kill) an opponent with just a wooden sword. In 1612, Musashi fought his last and most famous duel with Sasaki Kojiro, on Ganryu Island and defeated him with an oversize bokken he is reputed to have carved from a wooden oar. However, the resort by Bokuden to using two wooden lids, exemplifies (perhaps) that he was unable to reach for bladed weapon when attacked and his ability to utilise an everyday household item, with which to competently defend himself. Perseverance with practice and a willingness to employ strategies for survival. The swordsman Miyamoto Musashi fencing with two wooden swords against old master Tsukahara Bokuden who defends himself using two wooden pot lids. 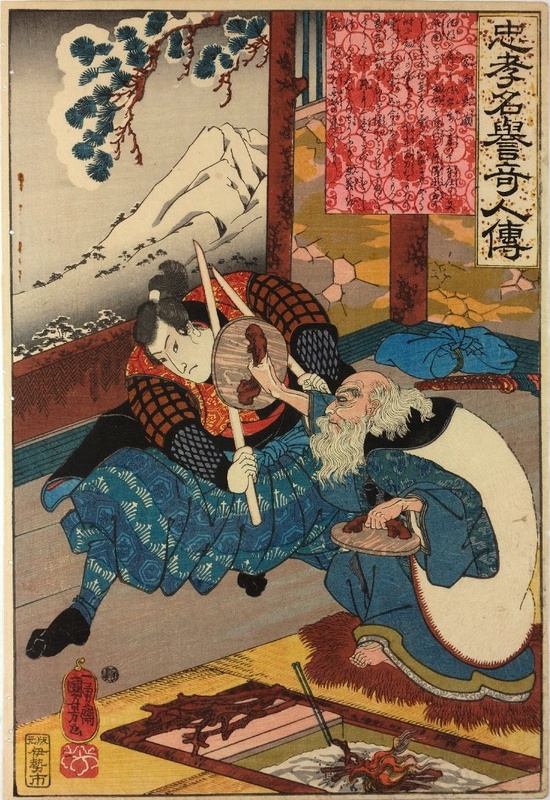 Woodblock print by Utagawa Kuniyoshi (歌川国芳).